Last week, Delhi was enveloped in a thick blanket of smog—a mix of fog, vehicle exhaust and fume and soot from other combustion sources. Media is abuzz that India’s national capital has beaten Beijing to become one of the most polluted cities in Asia. Though Delhi media has been reporting on air pollution situation in Delhi for some time, this winter we saw growing international focus on Delhi and Beijing. This is mainly because these two cities have become the face of economic growth and its pollution aftermath in Asia. The article in New York Times and a few others that followed stoked global curiosity further and led to a deluge of articles in both national and international media. The focus also led to the unfolding of the story of the relative role that both conventional and new media have played in building public opinion in these two cities to create public pressure for policy action. This is more evident in Beijing. This growing media interest in Beijing and Delhi’s pollution story has been prompted by a series of global studies ranking or assessing the air pollution and public health crisis across countries. 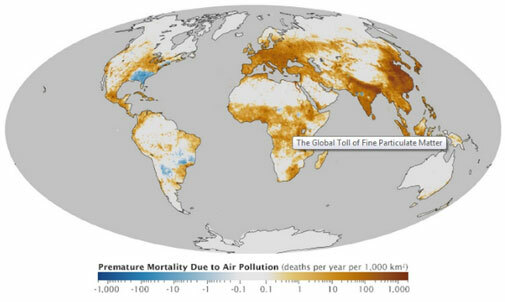 Last September, the United States space agency, NASA, published a map that showed how the rates of premature deaths from air pollution vary around the world. It indicated that northern China has one of the worst rates, attributed to the density of a deadly fine particulate matter—PM 2.5, matched by a diagonal belt stretching from Delhi south-east to Kolkata. The acutely polluted areas are coloured dark brown on the NASA map (see map). Both the belts show very high risks. Only last year the Global Burden of Disease estimates had had shown that air pollution-related diseases have emerged as the fifth largest killer in India. Subsequently, another study showed that Indians have the world’s weakest lungs. The World Health Organization says India has the world’s highest rate of death caused by chronic respiratory diseases, and it reports more deaths from asthma than any other nation. A global analysis on how nations fare in environment performance, generated by researchers at Yale University in 2014, has ranked India 155 among 178 nations and labelled the country’s air quality among the worst in the world, tying it with China in exposing its population to hazardous air pollution. Compared with environment performance index (EPI) 2010 — when India ranked 123 among 163 countries — the rank of 155 now among 178 countries suggests that the country’s position has worsened since then. Beijing builds transparency and action: The 2008 Olympics was a turning point for Beijing when the city was mandated to maintain clean air quality during the games. China dazzled the world with its ability to clean up Beijing for the Olympic games, but the fact that many of the world’s most polluted cities are in China remains a stinging reminder that cleaning up for the Olympics addressed only a small part of China’s air pollution problem. After the games, the problem of smog returned in a big way and the monitoring station at the US embassy kept putting out data showing how hazardous it was for people. The authorities insisted that Beijing’s air quality had improved steadily with the city’s decade-long pollution-control efforts. But they were frequently challenged by the embassy’s shocking pollution readings, which were in contrast to those released by the city. This led to tension between Chinese government and the US embassy. The air quality monitoring and public information system that the US embassy in Beijing had started in 2008 to record air quality during the Olympics stirred public reaction. The hue and cry that followed helped to bring about greater transparency in the public domain. Now actual pollution concentration data is publicly available from the Environment Protection Bureau. China’s environment ministry has its own monitoring programme, and it puts that information out on its own. It’s generally considered to be accurate data now. The Beijing government even went a step forward to start a public information system to alert people about the daily air quality with health advisories. Public health impact of air pollution is enormous. According to a 2007 report of the World Bank and Chinese government, up to 400,000 Chinese die prematurely every year because of air pollution. The concentration of PM2.5 was on average 10 times higher in Beijing than in New York. But such figures alone don't tell the story. Impact of media and social media: The new media played an important role in building public opinion in China. Asia Society, an educational organisation, launched China Air Daily in 2007, a website that provides up-to-date information on air pollution in the country's largest urban sectors, and even compares them to major cities elsewhere in the world. This website lets people see up-to-date photographs of the air in Beijing, Shanghai and Guangzhou. Pictures of stifling haze and smog posted and circulated online by netizens depicted extreme pollution. Weibo, an online social media like Twitter in China, was used to put out the data which made it a whole lot easier to share this information with people. The United States Embassy in Beijing posts on Twitter (@BeijingAir) the readings of its air monitor, to build awareness and interprets the data in relation to more stringent standards. The readings have more than 35,000 followers. Government censors in China had blocked widespread coverage of the problem for years, but they loosened the restrictions during an surge in pollution across northern China in January 2013; now even official state-run Chinese news organizations report regularly on air pollution. One incident happened last year in October in the northern city of Harbin, where the smog got so bad that one couldn’t see halfway across the street; schools and the city’s airport had to be closed. The media had already been covering this issue extensively and helping people understand the adverse effects of air pollution. Beijing has its own air quality mobile applications for both Andriod and IOS, such as Air quality China which is for 140 Chinese cities, and within Beijing alone, one can chart and average air quality index from about 30 different monitoring stations, including the US embassy, to keep your hypochondria on the cutting edge. When PM 2.5 levels in the city rise, the chatter of Weibo swells and starts shouting out the data and even the authorities have understood well that open access to air quality data could help warn people when they should they be staying indoors and save the kids and elderly from it. Hard action: Public opinion has spurred hard policy decisions. Beijing government has been taking many steps to curb air pollution. This January, Beijing closed major highways and issued urgent health warnings to those living within its borders. This even led to panic-buying of air filters and face masks. Apart from this, the Beijing government has already fixed the number of cars sold in one year and this year the limit will be lowered further. They have also proposed banning half of private cars on the road based on odd and even licence plate numbers and introducing Euro V standards. Well-integrated public transport system is also being scaled up. Beijing even unveiled a plan last month to cut coal use in the industrial north, and to reduce air pollution by 20 per cent in Beijing over the next five years. The Mayor of Beijing, Wang Anshun, recently announced that the government would take 180,000 old vehicles off the road this year and control the "excessive" growth of new car sales. The heating systems of 44,000 old, single-storey homes and coal-burning boilers downtown will be replaced to run on clean energy. Beijing will complete afforestation of 66,000 hectares in the next five years to increase the city's forest cover to 40 per cent or above. The city also plans to reduce coal consumption by 1.4 million tonnes and volatile organic compounds emissions by 8,000 tonnes, in addition to closing some 450 heavily polluting plants. On the other hand, life in Delhi has gone on like normal, despite the fact that on an average the city’s harmful air particulates are nearly double that of Beijing. Delhi’s peak pollution levels have increased 44 per cent over the past year. 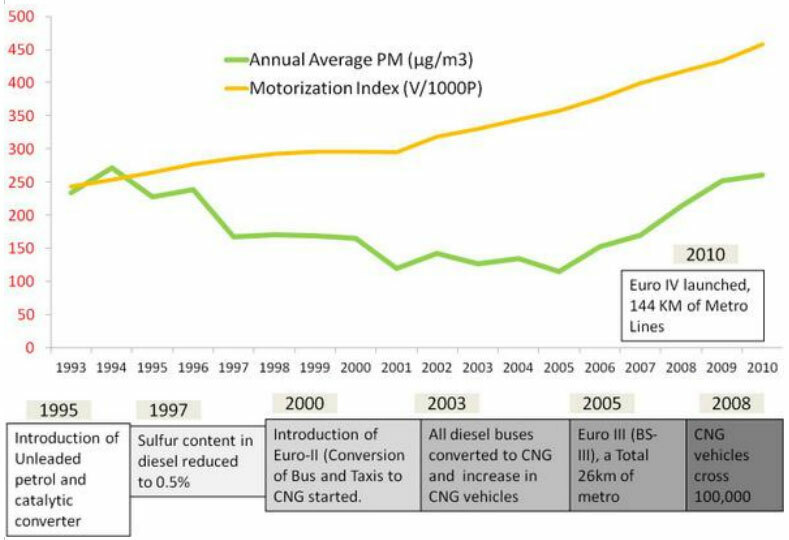 In 1998, India’s Supreme Court ordered that Delhi’s taxis, three-wheelers and buses be converted to compressed natural gas (CNG), but the resulting improvements in air quality were short-lived as cars flooded the roads. In the 1970s, according to government statistics—which probably don't account for cars passing through from neighbouring regions—there are more than 7.5 million cars on Delhi's streets, compared with just 500,000 in 1981. Some 1,400 new vehicles hit the road every day. In Delhi and other Indian cities public action has been more by way of public interest litigation wherein people moved courts to seek redress. 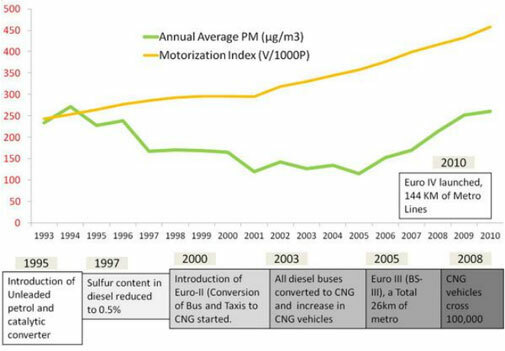 In Delhi one of the largest CNG programmes under way, emissions standards were improved and polluting industries shifted out because of public action. Even media has come forward to build public discussion around those interventions. But now people, though concerned, are not aggressive enough in their articulation of anxiety about the air to push for change. One of the reasons is poor information in the public domain. The following figure shows the interventions taken by the government in the past 10 years which could not control the rising vehicular and pollution figures. Even Delhi’s newly elected Aam Aadmi Party (AAP) government did not mention air pollution among its 18 priorities. Even the media wakes up only when it gets mentioned in foreign media. Unlike Beijing or other Chinese cities, Delhi government does not put out information in a more appropriate manner so that people can understand what it means. Even though Delhi Pollution Control Committee (DPCC) and Central Pollution Control Board (CPCB) undertake real-time monitoring, the data available is difficult for a layperson to understand. There is no awareness among the people in the city about the health hazards from daily air pollution and the precaution they need to take as the government is not putting out data with health advisories. Over the years, reporting on air quality by the Indian news media has grown but this needs to be more consistent and aggressive to inform people to help push the government to take stringent steps to control the air pollution. The new media including social media has an important role to play. Otherwise, till the time air doesn't start stinking real bad, we will continue pretending as if nothing has happened and continue to breather the killer air and compromise our and our children's health.